Never say “how about this weather?” to a landscape photographer on a bright blue sunny day. If you do, you’ll like hear him/her groan and mumble something about clouds. Nature photography is about about dramatic light and there’s nothing dramatic about blank blue skies. It’s one of those things that you just have to accept if you spent any time photographing in Yosemite. The typical spring and summer weather patterns bring many cloudless days to the park. For a picnic on the bank of the Merced River it’s really nice. For landscape photography, not so much. Since I spend so much time shooting in Yosemite, I’ve come to expect blue skies. If anything, I take it as a challenge. As the saying goes: “When life gives you lemons, make lemonade.” There’s often a notion that when you shoot landscapes, you need to include sky. One strategy that I take is to minimize the sky. I’ve a number of Yosemite images with no sky at all. I subscribe to the adage “if it’s not interesting you don’t need to include it.” For this image, I did the exact opposite. Rather than minimize the sky, I exploited it. To make the image work I had to break some rules. I was shooting from the Tunnel View overlook in Yosemite. It’s a very iconic location and millions of images are made there every year. Rather than try to bring out detail in the foreground, I made a conscious choice to drop the whole scene to a silhouette. The shape of El Capitan and Half Dome are instantly recognizable by anyone who has every been to the park or seen pictures; just having their shape places the image. The next “rule” involved aperture. Experts will tell you, and I even had this talk with the group that I was leading last week, that apertures above f/11-f/13 will cause diffraction and soft shots. What I tell folks is that unless you have a specific reason to go above f/13, don’t. In this case, I had a specific need. With all of the negative space that the sky was giving me I needed an object to anchor this shot. To get the starburst effect on the rising sun, I set my camera to f/22 before it starting coming over the ridge. The exposure was 1/50th of a second at ISO 100. I was using my Canon 5D with my Canon 24-70 f/2.8L attached. 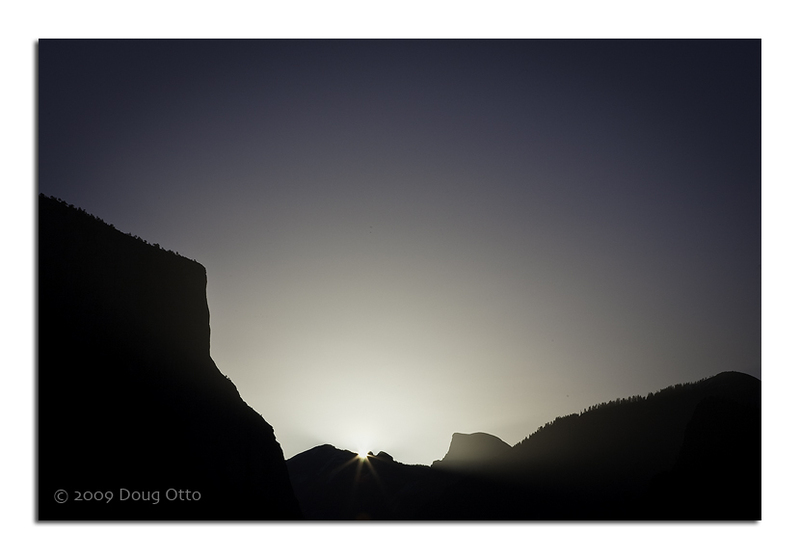 This entry was posted in Photography and tagged Canon 24-70 f/2.8L, Canon 5D, Cloud's Rest, diffraction, doug otto, el capitan, half dome, Photography, Sentinel Dome, starburst, Sunrise, yosemite. Bookmark the permalink.